Ornamental fences provide stylish look without all the maintenance. 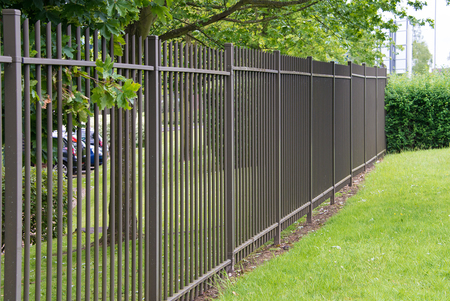 Steel or aluminum fencing are both strong and very weather resistant. The steel fence above is a standard black steel fence. As you can see, it is attached to the stone pillars. The brick give more secure fit and a decorative look. Here is the standard metal fence, but without the stone pillars. Above is a more decorative steel fence. This is a shorter style with decorative tops. Above is a shorter, traditional steel fence. This type is less expensive than a decorative steel fence.